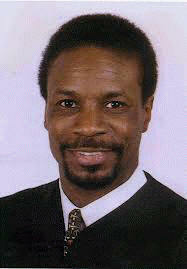 The Honorable Judge Herman Marable Jr.
who is going above and beyond to help others in our area. At the age of 10, Herman Marable Jr. was reading a biography of Thurgood Marshall, an attorney for the NAACP and the first African American judge to serve on the U.S. Supreme Court. The impact of this book, along with his parents' zeal for community service, ignited Marable's desire to make sure the courts serve the needs of his community. 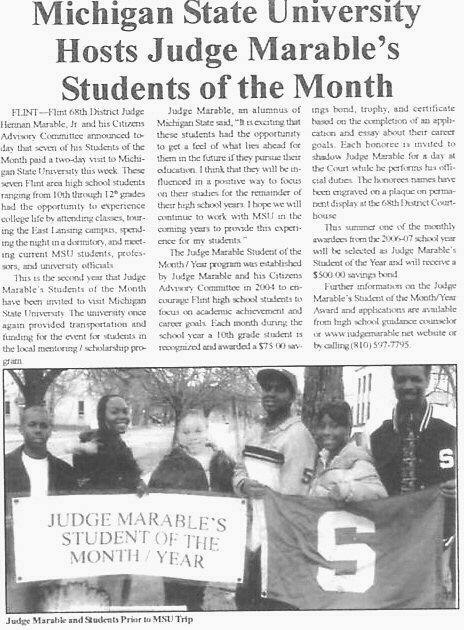 Today, Herman Marable Jr. is a Genesee County 68th District Court judge and the creator of two recognition programs that reach beyond his bench duties. To that end, he appointed a Citizens Advisory Committee to review community input, and established the "Judge Marable Student of the Month/Year Program" to encourage high school students to focus on education and career goals. Recently, he expanded this concept to include seniors who work to improve the community. 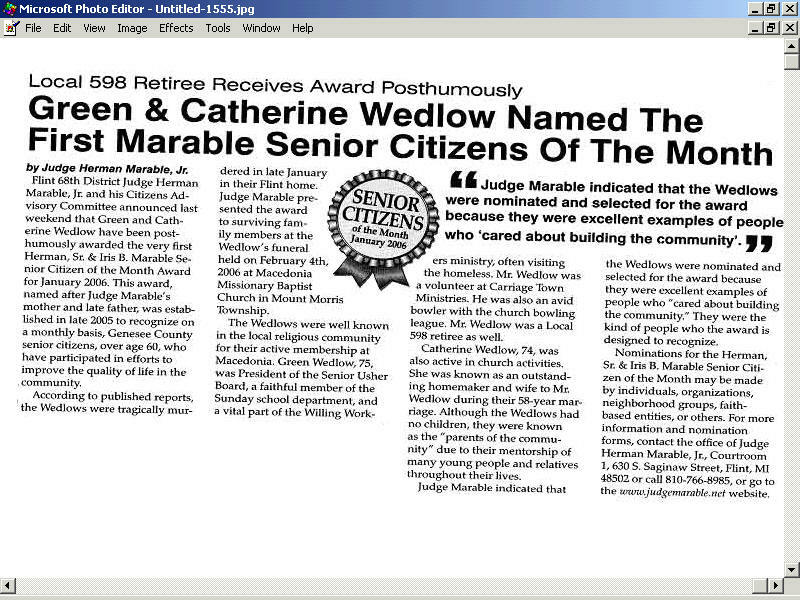 The "Herman Sr. and Iris B. Marable Senior Citizen of the Month Award" is named for Judge Marable's mother and late father. His father, Herman Marable Sr. was active during the open housing movement in the 1960s and human rights causes in later years. Iris Marable helped start a block club. Both instilled in their son a deep concern for others. The Student of the Month Program elicits applications from 10th graders, an age, he says, when career goals are still attainable and might benefit from encouragement. "A 500-word essay on career goals from city students might prompt them to look down the road," Marable says. "It gives me a chance to emphasize the seriousness of education. Some kids do not think it's cool to get good grades or NOT to cut classes. They may not have support at home and may even be ostracized by peers for doing so. "Students of the Month award winners are given a certificate and trophy and a $75 U.S. Savings Bond. More importantly, their name is added to a plaque in Marable's courtroom. They are given a choice of where they would like the trophy presented (church, school, court, etc...) where it would have the most meaning. Additionally, the winners are allowed to shadow Judge Marable for a day on the job. Students sit by him at the bench and witness real-life consequences for bad choices. Sometimes Marable points out the student plaque to people appearing before him. Students of the Month are also treated to a day at the Michigan State University where they visit a class and athletic event and stay in a dorm. The monthly winners then vie for Student of the Year, which carries a $500 Savings Bond award and other special recognition. Just as Marable is known for his innovative sentencing, his recognition programs are financed by an equally innovative fund raising method. He enters local. 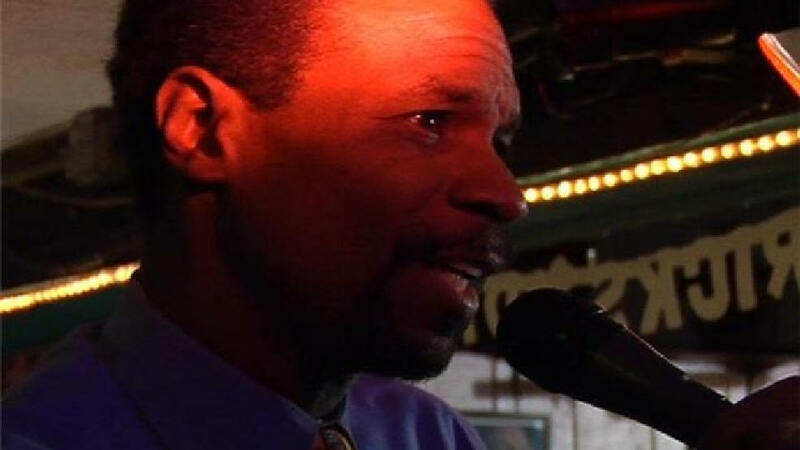 regional and national karaoke contests and donates his winnings to this cause. He even performed in the Karaoke World Championship Contest in Finland last summer. In addition to these honors, Marable is listed in the31st Edition of Outstanding Young Men of America 1998, Black Judges of America, Who's Who in American Law and Who's Who Among African Americans. 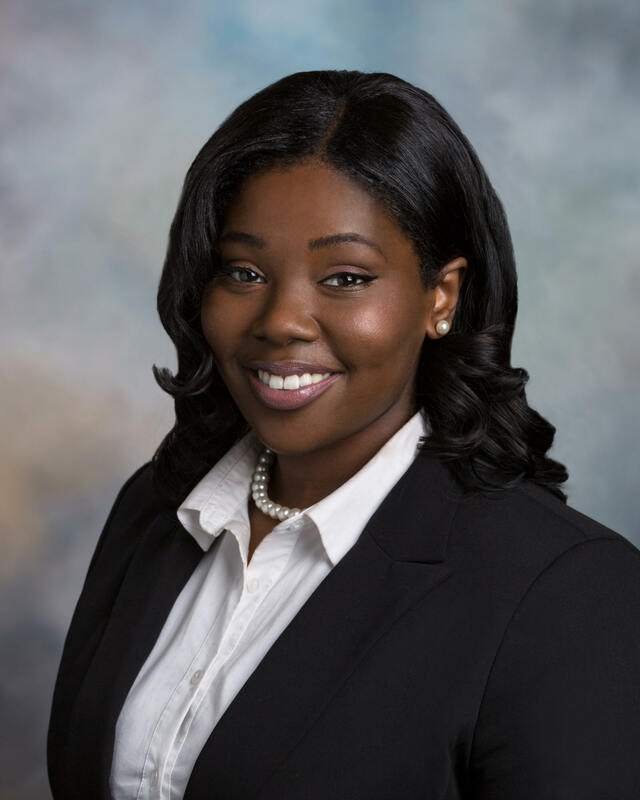 Judge Marable is a Flint native and former Assistant Prosecuting Attorney of Genesee County and law clerk with UAW-GM Legal Services. He earned a Juris Doctorate degree from Ohio State University College of Law and a Bachelor of Arts degree in American Public Policy with emphasis in Metropolitan Studies from James Madison College at Michigan State University. He has lived and served the majority of his life in this area with the exception of a two-year stint in Pittsburgh when he was an Assistant District Attorney of Allegheny County. 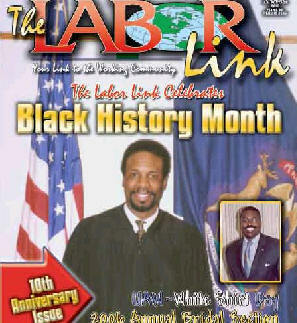 He has been active over the years in many community, political, civic, and professional organizations. During Black History Month, it is fitting to honor a Flint-born African American who not only serves his community in a professional capacity, but also orchestrates programs that impact the future. 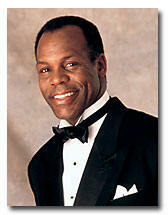 Danny Glover, an acclaimed actor and humanitarian, will be the keynote speaker at the Roeper School's 12th annual gala and awards dinner, 6:30 p.m. Feb. 17 at the Ritz-Carlton hotel in Dearborn. The Roeper Gala was established in 1990 to celebrate the school's 50th anniversary. The gala regularly features a prominent speaker and five or six awards presented to individuals or organizations that have contributed positively to the metropolitan area. This year's recipients include Forgotten Harvest, a nonprofit that has worked to alleviate hunger in the Detroit area, and the Honorable Herman Marable Jr. of the 68th District Court. The Roeper School is an independent, private school with campuses in Birmingham and Bloomfield Hills that teaches students from preschool through 12th grade. Herman Sr. & Iris B. Marable Senior Citizen of the Month Award for January 2006. 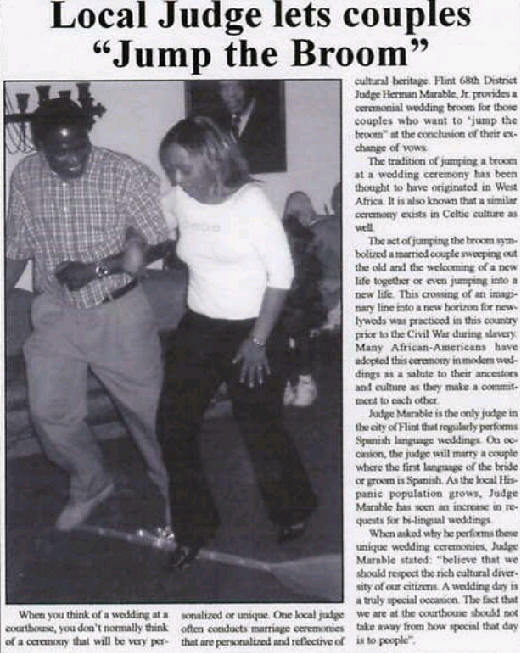 Local Judge lets couples "Jump The Broom"